Western blot analysis of extracts from HeLa cells, untreated (-) or treated with Human Tumor Necrosis Factor-α #8902 (20ng/ml, 30 min; +), using Phospho-Stat3 (Ser727) (D8C2Z) Rabbit mAb (Biotinylated) (upper) or Stat3 (D3Z2G) Rabbit mAb #12640 (lower). 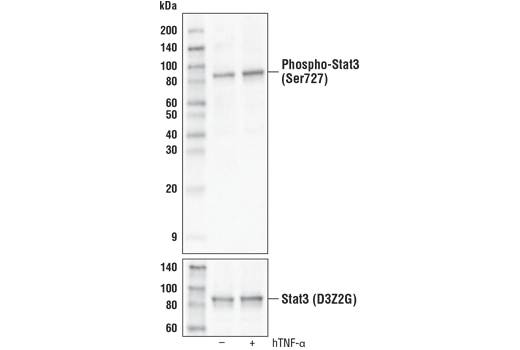 Phospho-Stat3 (Ser727) (D8C2Z) Rabbit mAb (Biotinylated) recognizes endogenous levels of Stat3 protein only when phosphorylated at Ser727. Monoclonal antibody is produced by immunizing animals with a synthetic phospho-peptide corresponding to residues surrounding Ser727 of human Stat3 protein. This Cell Signaling Technology antibody is conjugated to biotin under optimal conditions. The biotinylated antibody is expected to exhibit the same species cross-reactivity as the unconjugated Phospho-Stat3 (Ser727) (D8C2Z) Rabbit mAb #94994. The Stat3 transcription factor is an important signaling molecule for many cytokines and growth factor receptors (1) and is required for murine fetal development (2). Research studies have shown that Stat3 is constitutively activated in a number of human tumors (3,4) and possesses oncogenic potential (5) and anti-apoptotic activities (3). Stat3 is activated by phosphorylation at Tyr705, which induces dimerization, nuclear translocation, and DNA binding (6,7). Transcriptional activation seems to be regulated by phosphorylation at Ser727 through the MAPK or mTOR pathways (8,9). Stat3 isoform expression appears to reflect biological function as the relative expression levels of Stat3α (86 kDa) and Stat3β (79 kDa) depend on cell type, ligand exposure, or cell maturation stage (10). It is notable that Stat3β lacks the serine phosphorylation site within the carboxy-terminal transcriptional activation domain (8). Heim, M.H. (1999) J Recept Signal Transduct Res 19, 75-120. Takeda, K. et al. (1997) Proc Natl Acad Sci U S A 94, 3801-4. Catlett-Falcone, R. et al. (1999) Immunity 10, 105-15. Garcia, R. and Jove, R. (1998) J Biomed Sci 5, 79-85. Bromberg, J.F. et al. (1999) Cell 98, 295-303. Darnell, J.E. et al. (1994) Science 264, 1415-21. Ihle, J.N. (1995) Nature 377, 591-4. Wen, Z. et al. (1995) Cell 82, 241-50. Yokogami, K. et al. (2000) Curr Biol 10, 47-50. Biethahn, S. et al. (1999) Exp Hematol 27, 885-94.